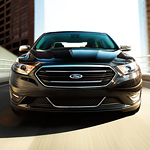 If you’re planning to purchase a new full-size sedan, it’s time that you got to know the reliable Ford Taurus. Keep reading to find out more about the latest features associated with this highly popular vehicle model. The design team behind the Ford Taurus endeavored to create a vehicle that’s a pleasure to look at and to drive. The sleek, eye-catching exterior is sure to turn heads, and the front grille and lighting combination serves to make a strong visual impact. Numerous color options are intended to mesh seamlessly with each driver’s personal tastes, and a variety of wheel finishes and sizes that range from 18 to 20 inches also offer adequate opportunities for customization. Plus, the attention to detail doesn’t end with the exterior. The Ford Taurus’s interior is equally well-appointed with an array of premium features and amenities.